"…just WOW, it [WOW] is cool, easy-to-use, quick, and you can do a lot with it." Analytical Healthcare (AHCS) provides service to medical clinics and was in need of simplifying and increasing the speed of access to patient immunization records. This would minimize return patient visits and provide simplified, cost effective patient care. Developers at AHCS utilizing PlanetJ's Web Object Wizard created a secure Web site allowing nurses and physicians to obtain immediate patient immunization data all from a browser interface. AHCS was able to develop this application quickly and easily accessing iSeries based data with no formal training. PlanetJ's WOW development tool allowed AHCS the capability to build an application that is Internet based, secure and utilizes existing iSeries database files without the need to learn complex technologies such as Java and WebSphere. Analytical Healthcare Solutions, Inc. (AHCS) is a business built on electronically simplifying information using new technologies and statistical algorithms to streamline healthcare management and cure information overload for medical providers and insurance companies. These algorithms allow cost effective problem solving without spending unnecessary time weeding through unrelated information. AHCS also offers solutions to business operations management and benchmarking analysis to assist medical businesses to operate at a comparable level. As stated by Todd Humphrey of AHCS, "just WOW, it [WOW] is cool, easy-to-use, quick, and you can do a lot with it". Recently, AHCS used WOW to develop another application for a client working with insurance data from both the iSeries and MS SQL. The WOW application linked the two databases saving the customer hours of time building cross-reference tables. 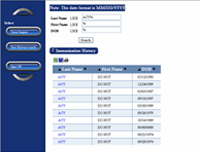 The immunization application built using WOW for AHCS functions appears as below: (Due to privacy laws in accordance with HIPAA, patient names have been removed from the screen shown). Once clicking on the last name of the patient, further information can be drilled into from AHCS's databases. 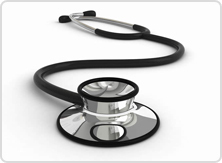 As you can imagine, security is of utmost importance to medical professionals. Using this application, the end user can enter the site from any browser. The firewall securely directs the request using SSL encryption and then forwards the requests to WOW, which is running on top of Tomcat application server. 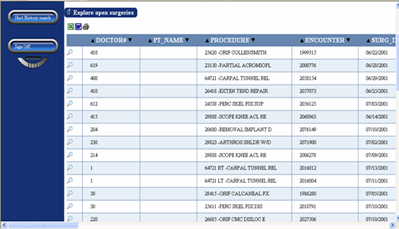 Another application that AHCS developed using the WOW enables a way to view and update a surgery encounter report. A secured login is required as seen below: (again based on privacy laws, patient sensitive information has been removed from the pictures). 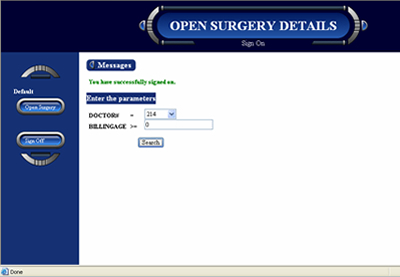 The physician or scheduling coordinator can then view surgical report as seen here. WOW and Analytical Healthcare built Web based self-service sites quickly, which allows customers to access timely, up-to-date information from their IBM iSeries. This application has saved so much time and increased customer satisfaction. WOW provided the ease of use, security, and productivity without the need for complex Java programming. Also stated by Todd Humphrey "all you really need to know is SQL." Contact PlanetJ to see how you can benefit from this revolutionary tool.